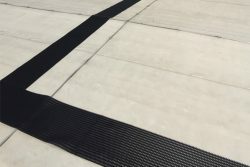 Heightsafe Systems provide a number of innovative solutions for all walkway applications. 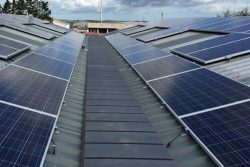 Our main products are listed below, so please click on the link on each for more detailed applications, descriptions and features of the benefits of each of the uPVC, GRP, anti slip roof walkways or the lighter aluminium roof walkway systems and its many features. As part of ongoing product development, we have brought in our partners’ manufacturing skills and knowledge to a design requirement for a new railway platform decking system, made from composite materials. We work closely with Network Rail who have tested and approved this exciting design, and now use the roof walkway systems to bring a new revolution in platform surfacing solutions. 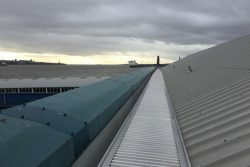 This is just one of many applications that Heightsafe Systems have been involved in recently. 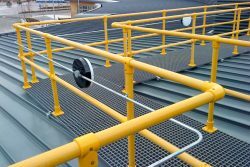 We sell and install our roof access uPVC walkways to manufacturing and industrial plants, local government and infrastructure projects and hospitals, to name a few. We work closely with contractors, quantity surveyors, architects and designers to ensure that we delivery the height safety systems our clients require. So, for more information about our services, contact us today.